Stormont Estate is open to the public for recreation. Find out about visiting the estate, walking and fitness trails, the children's playground, events and the environment. 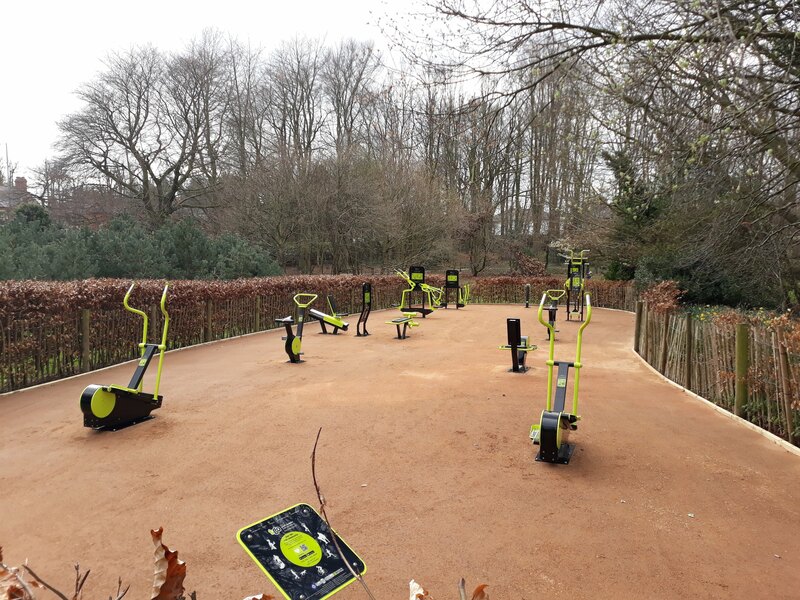 The new outdoor gym on the Stormont Estate is open and includes a range of cardio and toning equipment. New outdoor gym at Stormont Estate. Chest press and seated row Builds muscles in the upper chest. Dips and leg raise The dip works the chest muscles while the leg raise works the stomach muscles. Lateral pull down Works the largest muscles in the upper body. Shoulder press Mainly works shoulder muscles. Leg press It exercises the four muscles on the front of the thigh (quads); a group of three muscles which make up the buttocks (glutes) and a group of muscles at the rear of the upper leg (hamstrings). Sit up bench Strengthens stomach muscles. Pull up and assisted pull up Exercises the upper body. Two spinning bikes You sit on a seat and pedal to get your workout. Two cross trainers It's like an exercise bike with no saddle, on which you exercise the arms and legs. Recumbent bike It places the rider in a laid-back reclining position, giving you good back support while you cycle. To find the new outdoor gym, enter the Stormont Estate through the main pedestrian gate on the Newtownards Road. Take the first path on the left of the main avenue and walk the short distance to the gym. Stormont Estate has been awarded the Green Flag for five years in a row since 2014. The ‘The Green Flag Award’ is the most accepted national measure of quality for the management, operation and improvement of free public parks and green spaces. The award is overseen by 'Keep Northern Ireland Beautiful' who arrange for independent judges to visit and score against set criteria. Stormont Estate is in the east of Belfast, on the Upper Newtownards Road (A20). When travelling along the Upper Newtownards Road, the large entrance to the estate is visible on the left, about five miles from the city centre. A second entrance for the public on foot is available at Massey Avenue, Belfast BT4. Parking is available in front of the main gates on the Upper Newtownards Road, at the Massey Avenue entrance and in the play park car park located on the left about 100m after the main gates to Stormont Estate. The Mo Mowlam Play Park for children is closed for refurbishment and is expected to reopen June 2019. Aside from the beautiful gardens and mature trees, you can also see historic buildings, statues, memorials and other interesting features. Parliament Buildings is home to the Northern Ireland Assembly, the legislative body for Northern Ireland established under the Belfast Agreement 1998 (Good Friday Agreement). It is open to the public for visits and tours, find out more at link below. While usually closed to the public, Stormont Castle does open its doors once a year for the European Heritage Open Day (EHOD) weekend on the 8 and 9 September 2018. The programme of events should be available from the 13 August 2018 on the Discover Northern Ireland website. The 12ft figure stands on a granite plinth, which shows images of the events in Lord Carson’s political life on four bronze plates. Originally exhibited as part of the 1951 Festival of Britain, this sculpture shows a woman on a bended knee gathering, with the inscription ‘Thrift is the gleaner behind all human effort’. A granite stone placed in the centre of a group of Cedar trees, which were planted in memory of those who lost their lives at the Battle of the Somme. The children’s play park is close to the main entrance on the Upper Newtownards Road. Coming out of Belfast city centre, the car park is on the left about 100m after the main gate to Stormont Estate.